Please note The workload overview only shows the workload and allocation of tasks that have a start and end date. The resource overview shows you a visual overview of the workload allocation during the specified date range. You can decide which resource’s workloads you want to see in the resources and workload allocation overview. The overview also shows, in addition to the project tasks, the Free/Booked information from the Exchange Server, if the option is selected. Your own, project-independent tasks are also displayed in the workload overview. 2. Display the side panel, if it isn’t open already, by clicking on Divisions and Teams in the ribbon. 3. Select a group from the Divisions and Teams side panel for which you want to show the allocation. 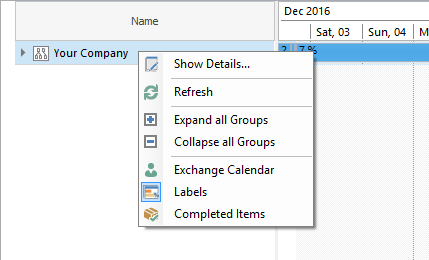 To do so click on the Display icon next to the respective groups or you can also drag-and-drop the group into the list on the left. 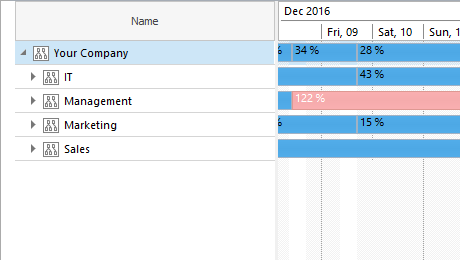 For example, drag the group Your Company into the list to show the workload allocation of your entire company. 4. 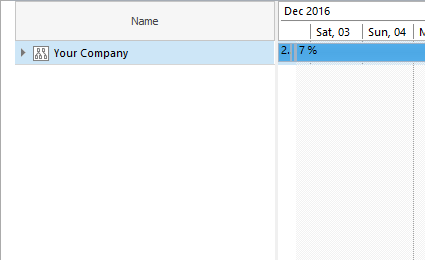 If you want to see how the workload is divided between the departments within your company, you can open the subordinate groups by expanding the group My Company. To do so just click on the arrow next to the group you want to expand, or expand the group by opening the context menu with a right click and expand it with Expand All Groups. You can see that in the above example, the company as a whole isn’t over-allocated, but the department Management is over-allocated. It is also possible that it is not the whole department that is over-allocated, but only one of the resources is. In such cases it is advisable that you re-assign the tasks to relieve the over-allocated resource. Show the workload in the resource overview | InLoox 9 for Outlook • Copyright 1999-2019 © InLoox, Inc. All rights reserved.